One snowy Christmas eve, my father came home with a bounce in his step, a smile on his face and a twinkle in his eye. Along with this energetic demeanor, he also had a bag, a big bag with a big box in it. “What’s this? What’s in the bag?“ We could tell this was going to be something big, because he was all “presentational” about it, and after a deep breath, he told us. Over the strains of The Julie Andrews Firestone Christmas album playing in the background, he told us; this wasn’t just a simple present. This was a “family” present. That had to mean something big, right? Something great, and something amazing. With great restraint and absence of inflection, he said it was “Pong.” Pong, the very first home video game on the market. “Pong”- even the name was fun. We had only heard of it, whispered of its glory on the playground, but here he was, my father, with an actual Pong game in his big, strong hands. For us! For Christmas! We couldn’t believe it. He was so proud and we were in awe. He was a god at that moment, a prince among men. He must love us very much to bring home such a trophy, such a grand display of fun and affection. It was quite a moment for our family. Those 10 minutes spent hooking it up to the TV seemed like a century. We were giddy with anticipation. “Hurry up, Dad!“ ”Hurray for Dad!” “Hurray for Pong!” we cheered. I thought about how jealous my friends would be when I told them we had Pong. And then, after what seemed like an eternity of wires and swearing and static and more swearing, the screen changed from snow to black and our television was transformed into a game! It was magical! There we were, in our family room and we were playing an arcade game, in the family room, an arcade game! And oh, how we played. It was a delight; it was fun and fabulous and amazing and everything we had hoped for. We cheered and laughed and my father was a hero; everyone knew it. This was Frank Woodworth’s moment; he was in his glory, for exactly eight minutes. My brother dared to be the first to say what we were all thinking, “That’s it? That’s all there is?” With those few words, my father’s shoulders fell. It was over. The golden glory was gone. 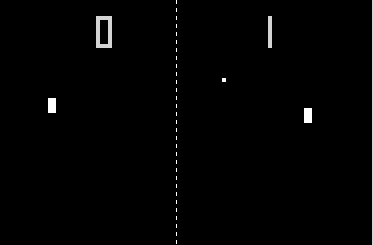 For those of you who don‘t know what Pong is, to call it “basic” is a bit like saying an overhead projector is cutting edge technology. Like saying guys who work at NASA like science. It is the MOST simple of video games. Although the box “claimed” to have 3 different games in 1 console, those games were in fact: tennis, badminton and ping-pong. I think you know where I’m going with this. In essence, one player rolled a dial (yes, a dial) that controlled a white “bar” on the screen that moved up and down. Not across or over or under, just up and down, and a square “ball” would bounce back and forth; the mission was to hit the ball with your bar. If you did so, it would make a sound, much like the game’s name. It you missed, a new ball would miraculously appear so you could repeat this exercise ad nauseum. The ball moved at a snail’s pace, all this on a black background. The graphics were, well…not. It was the most basic, primitive game possible. A ball (for lack of a better word) went back and forth. That was it. It was the tennis without any of the fun of tennis. If Edison would have invented Pong, he would have considered it a failure and kept on trying until he ended up with Ms. Pac Man. It even bored the dog. “We don’t need to talk in the car. Americans are smarter than that. It’s unsafe….that’ll never catch on.“ That was my dad. A trend setter. Sadly, my father’s Pong stayed under the television, right next to the Beta recorder (see?) collecting dust. He didn’t give up though. He was undaunted. Years later, when my father would energetically ask “Who wants to play some Pong?” I respond with “I have homework” which was code for painting my nails, popping zits, or writing emotional, crappy poems in my journal. After the Pong bust, the cooler more versatile games starting coming out, like the “Atari” home system. Ohhhh, Atari. You know, where you could actually, you know, change the game? It was like an 8 track player (which of course, my father also owned) for games where you could pull different games in and out; it was the precursor for the Holy Grail of games, the Nintendo. I would beg my dad for an Atari system and he would say emphatically “No, play Pong! You have a perfectly good Pong game over there. You kids don’t appreciate what you have…” which was absolutely true.